Throughout the day, a massage therapist gave 10-minute neck and shoulder massages to promote relaxation. Geared exclusively toward women, presenters for the day included a self-hypnosis therapist, a journalist, Director of the Cheyenne River Sioux Tribe Fitness Center and a massage therapist. Joyce, a self-hypnosis therapist, introduced guests to the idea of hypnosis and shared exercises they could do on their own. She explained various techniques that could be used to help with issues like stress, smoking and weight loss. She shared ways journaling helped her come to terms with her past and guided guests through a journaling activity. Jarred, Director of the Cheyenne River Sioux Tribe (CRST) Fitness Center, spoke about nutrition and fitness. He shared the importance of reading nutrition labels and the connection between your mood and the kind of food you put in your body. He also stressed how working out is an important coping skill. Everyone received workout bands and learned easy workouts to do while sitting in a chair. Taking care of your skin can help boost mood and confidence, explained Breanne. 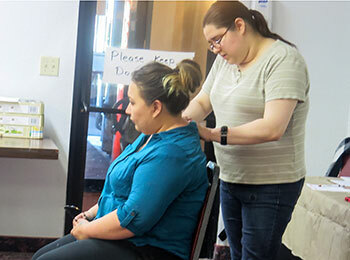 Throughout the day, a massage therapist offered free 10-minute neck and shoulder massages to promote relaxation. Thank you for your support of Cheyenne River Indian Outreach! Because of your generosity, lives are changing for the better.